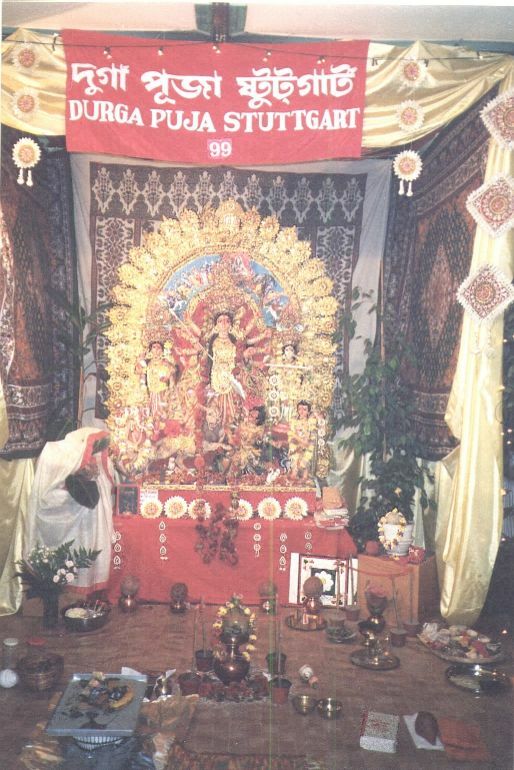 Since 1995 Durga Puja is being celebrated in Stuttgart which is the capital city of the state Baden-Württemberg in South Germany. This year in 2018 Durga Puja will be celebrated for 23 years now. It will be a great occasion like every year. Bengalis from South Germany come to enjoy the Puja at Stuttgart. All new guests are welcome to take part in the devotion of Goddess Durga. Please help us to make this Puja a great success with your kind contributions. A contribution is required from all guests to finance the Puja. We are looking for volunteers who want to help before, during and after the Puja days. If you are interested please contact Mr. Ganguly via e-mail. You need a real audio player which you can download free. to keep this website online. Puja Mandap is just a few minutes walking distance from the U-Bahn stop Hallschlag. Take the U-Bahn U12 upto Hallschlag. 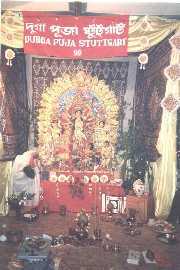 Puja Mandap is a few minutes walking distance from the U-Bahn stop Hallschlag. And here is a map from the U-Bahn stop to the Puja Mandap. Information about accommodation in Stuttgart are available on the following websites: site1, site2 and site3.